Aimed at desktop systems and casual gaming PCs, the Fractal Design Tesla 650W is happy delivering power to a range of system components that include mid-ranged PCI-E graphics cards and SATA based equipment. Designed with four 12 volt rails as standard, the Fractal Design Tesla 650W happily achieved 100 per cent of the manufacturer's claimed performance based on real-world scenarios throughout our testing using the common 12 volt rails. Perhaps due to its design, in terms of total efficiency, the Fractal Design Tesla 650W slightly lagged behind many other low-end power supplies like the Xigmatek 600W and the Antec TruePower 550W. It also lost out to most of the competition in terms of standby efficiency; being one of the poorer performers in its class. However, this PSU gained ground in terms of decibel noise when compared to similar power supplies in its class like the OCZ StealthXStream 2 600W and the Corsair HX 650W, coming in at a very respectable second place out of the seven similar contenders under test, which is good as this is supposedly a quiet design. The relatively standard 120mm fan did do a good job of venting heat well, helping to keep the PC cooler on the inside than at the outside exhaust, although the cables did get reasonably hot during high load tests. The tested rails were all well within the ATX-specified tolerances, comfortably meeting the standard. The Fractal Design Tesla 650W fared well in the jitter free voltage stakes at the 75 per cent load level, forming a fairly clear flat line to demonstrate low electrical interference for the end user. Fractual Design has tried to be a little different aesthetically, offsetting the plain black case with a white fan alongside the standard honeycomb venting, and we found the build quality of the Fractal Design Tesla 650W to be generally robust. It's a standard design with dimensions of 140 x 86 x 150mm weighing in at 1.984kg. The manufacturer's stated AC power input is 100V/10A 240V/5A 47/63Hz. The Fractal Design Tesla 650W comes with a disappointingly low total of 16 fixed output connectors; 1x ATX 20/24-pin connector, 1x ATX 8-pin connector, 2x PCI Express 6/8-pin connectors, 6x SATA connectors, 5x 4-pin peripheral (MOLEX) connectors, and 1x floppy connector. 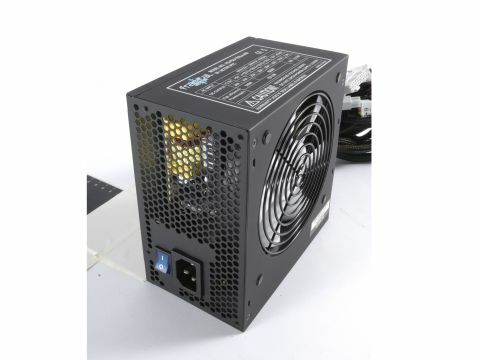 In general the PSU performed poorly compared to its peers in all but noise levels, couple that with a relatively high price and that it needs to improve its power efficiency and it's one to avoid.